Knitting stuff and going on and on. : Walk with me Wednesday two days late. Walk with me Wednesday two days late. 1 Ball - Naturally Aran yarn or other heavy worsted/aran weight yarn. 1 Set of 5 - 5mm DPN’s or needles required for gauge. Pattern: Left and Right are identical. 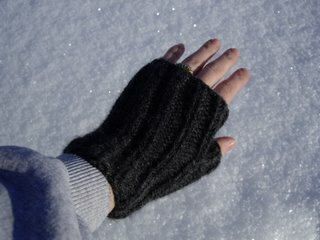 Mitts have a lot of stretch so they should fit comfortably on teens and ladies the width will fit up to a men's medium. You may need to lengthen cuff (around 2”/5cm should do it) and palm section (around 1”/2.5cm there) to fit the men, however. Divide amongst 4 needles (10 on each), join to work in the round. Be careful not to twist stitches as you join. Place stitch marker after first stitch to mark beginning of round. Rows 1 - 23 (about 3 ½”/9cm) K2, P2 around. Row 24 - Needles one and two - K2, P2. Needle 3 - P2, drop working yarn and join in waste yarn. K8. Pick up working yarn and rework stitches on Needle 3 as P2, K8. Return to 2x2 rib on Needle 4. Using 2 needles, pick up stitches on and above waste yarn (8 on each needle). Divide on 4 needles (4 on each). Needles 1 & 2 (bottom & right side) - P2, K2. Needle 3 (top) - K2, P2, Needle 4 - P2, K2. You’ll have to do some fancy picking up of bar/stitch below, k2tog on the first round to try to close the holes on the sides. Repeat stitch patterns on needles 1-4 for 8 rounds. Weave in ends and enjoy. Last night we found that the Optio does have some limitations. Like night shots at a distance with light in it. We tried and tried. Girly thought it was fun and had a blast mugging with the reindeer for the camera. 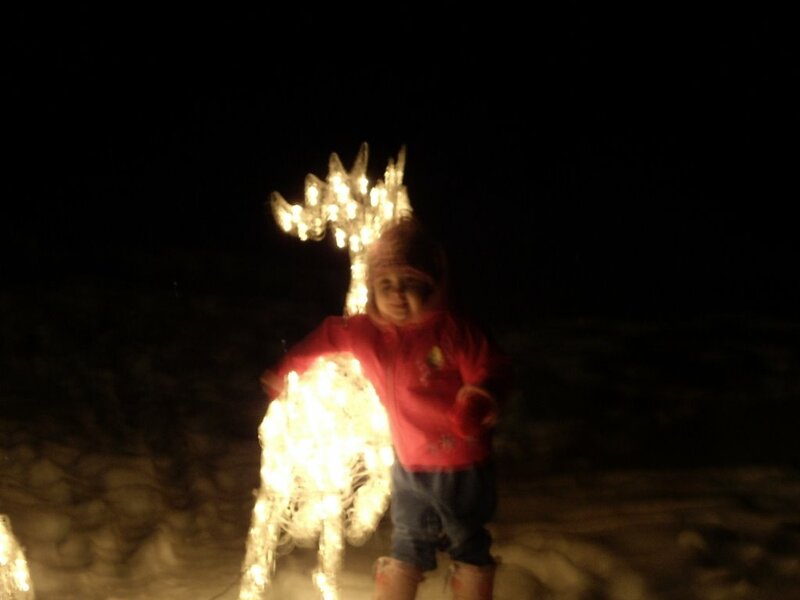 Sigh, I think I may be in for a worry or two when she is older. If we go to a night concert or other such event, we'll be taking the HP. It did pretty good with all that. This morning I woke up to find Madame Hoar Frost had come for a visit. So out I went to play. Small cameras are very hard to manage with mitts or thick gloves on though. I think I may have to give the Cigar Gloves in Knitty's archives a try. They would be perfect for playing with little cameras. 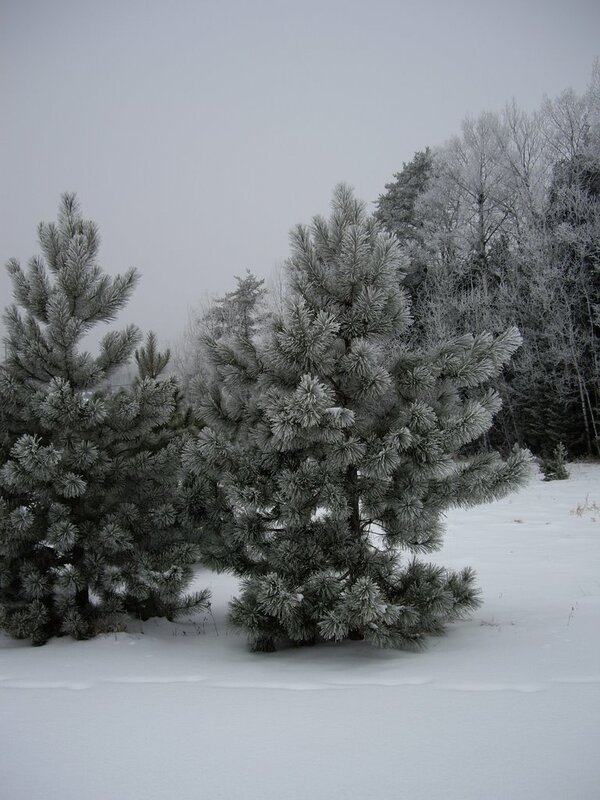 These trees look sort of like big fluffy teddy bears when they are all covered in frost like this. 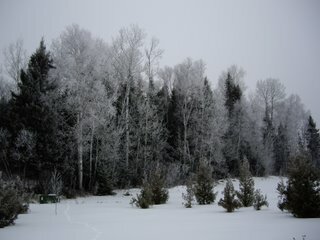 Madame Hoar Frost only visits one side of the trees. She covers one side in tiny ice crystals and the other in a light dusting of white powder. 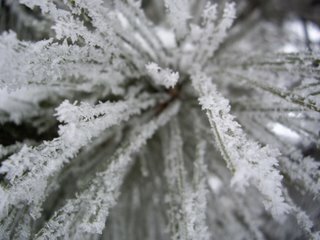 So many tiny ice crystals. Each needle gets it's own finery. 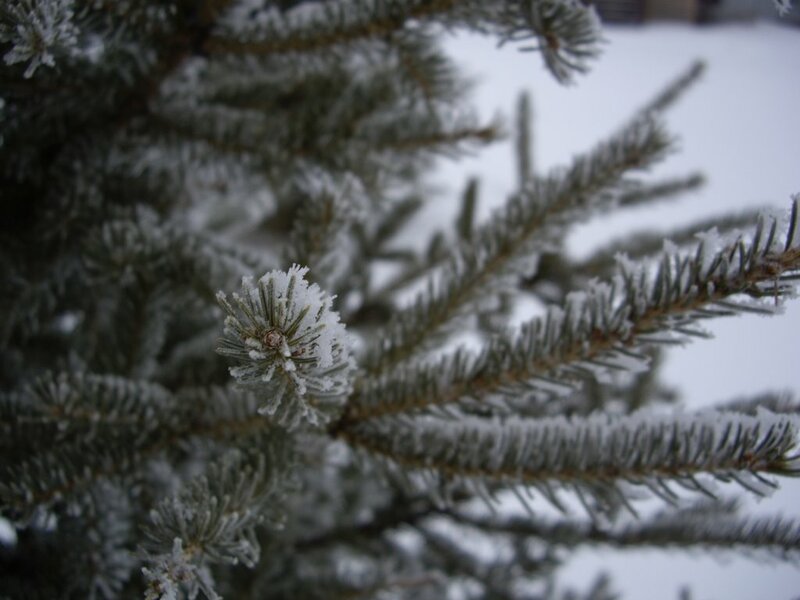 Love those hoarfrost pictures. I'm jealous because even though I hate being cold, we are STILL without snow in Vermont and the forecast is for rain on New Year's. WTF? I have a Canon PowerShot and I love it but I was frustrated, too, with some types of pictures when I first got it. I tried every different setting combination I could come up with but I did finally find a setting that worked. Just keep playing with it! Love the gloves! Your new camera takes perfect close ups. But you'll need to find the right combo for the night shots or distance. Hey, it's only been a few days practice right? Best part... no film! Soon it will be Christmas Eve. A bit of Christmas spirit for you.